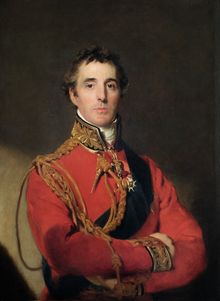 The Duke o Wellington, bi Sir Thomas Lawrence. Pentit in 1814, a few months afore the Battle o Waterloo. Field Marshal Arthur Wellesley, 1st Duke o Wellington KG, GCB, GCH, PC, FRS (1 Mey 1769 – 14 September 1852), wis an Anglo-Erse soldier an statesman, an ane o the leadin militar an poleetical figurs o 19t-century Britain. His defeat o Napoleon at the Battle o Waterloo in 1815 put him in the tap rank o Breetain's militar heroes.